Join the Museum of Natural and Cultural History and Thirst 2 Create for a fun-filled evening of science and art! Learn about Oregon's ancient sloths and explore the world of scientific illustration with museum exhibitions designer Liz White and University of Oregon graduate paleontologist Kellum Tate-Jones. 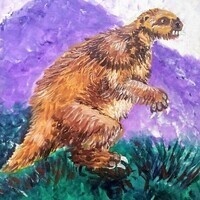 Then paint your own giant ground sloth with Thirst 2 Create! Food and beverage will be available for purchase. $40 per participant. Space is limited and preregistration is required. To register, visit www.thirst2create.com. Are you a museum member? Get a $10 discount with your special promo code! Email lmw@uoregon.edu or call 541-346-3030 for details.